Fresh food now, a secure food system for the future. 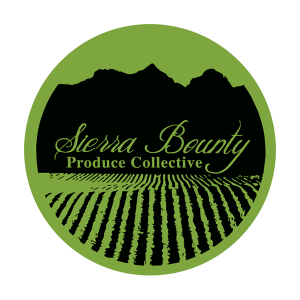 Sierra Bounty is committed to bringing you fresh produce from a collaboration of local farmers. We believe in a deep economy, knowing that investing in our farmers will result in strong roots and food security for The Eastern Sierra. For 16 weeks you will enjoy produce picked at peak ripeness–harvested within hours of reaching your kitchen. Experience the benefits eating locally has on your body and your community! What is a CSA model? CSA stands for Community Supported Agriculture. CSA’s present a great way for the public to access fresh local produce while supporting their community’s farmers. A CSA program is supported by it’s produce box members, who pay upfront for the delivery of produce over a season. Typically, a CSA is comprised of just one farm, but because there are so many smaller producers in the area, Sierra Bounty presents the unique solution of pooling produce from a number of farms. This is beneficial to the produce box member in that it creates a truly “bountiful” produce box, in which the produce travels from a small region but envelops significantly varying microclimates. So, Sierra Bounty isn’t technically a CSA, but we operate using a similar model. How do I become a produce box member? There are several ways to insure your spot in the produce collective. Click here for more information on cost, payment options, and how to sign up for Sierra Bounty. Is all of the produce organic? While not all of the produce in the box may be certified organic, all local growers supplying produce to Sierra Bounty are using organic methods, and likewise use environmentally responsible farming practices. Sierra Bounty emphasizes reducing the carbon footprint associated with non-local produce. Most produce grown in the United States travels an average of 1,500 miles before going to market. This figure doesn’t even take into account the produce imported from Latin America or Asia, so a tremendous environmental impact is made when supporting local agriculture! How often are produce boxes supplied and how much food do they usually contain? Produce boxes are picked up by members every Monday at Stellar Brew from 4:00-6:00 pm. Our produce boxes are ample, feeding 2-4 people for a week or more depending on the amount of produce consumed per family. Additional items are for sale including pasture-raised eggs, freshly cut flowers and artisan breads, extra fruit, jams, and sauces. 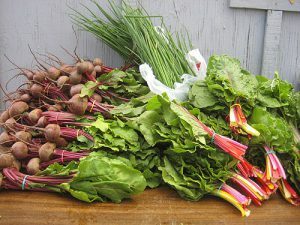 In the first week or so, boxes may seem skimpy, however, the abundance of produce available in early fall will exceed any produce box members expectations. Such drastic variances reflect the climatic and environmental challenges of growing produce in the Eastern Sierra, where the onset of the growing season can be especially delayed. How do I know what is in my produce box? There are a couple of ways to know what will be in your box each week! We have a sign posted at the pick up of all of the items that make it into your box that day. One option is to take a picture with your phone if you’d like to refer to the list when you get home and are unpacking your box. Also, we put a list of your veggies on our Facebook Page each Tuesday morning. So, now you are probably wondering why we don’t put a list in the weekly newsletter. A single farm CSA will always know what it has available to it’s members, however, we don’t always know what we’ll get for two reasons; 1. farmers surprise us with extra items at the last minute, and 2. we are increasingly interested in controlling the quality of the produce that makes it into your produce box. If a farmer presents us with a sub-par item, we won’t purchase it. In years past, we offered the list of expected produce items in the weekly newsletter, however, it turned out that there were variances that made it confusing for our members. What can I expect to receive in my produce share? What are the benefits of being a produce box member? Our members gain access to the freshest and most sustainably transported produce available in the Eastern Sierra. Boxes include a wide variety of produce that differs from week to week, allowing members to build meals around the seasonal yields. Our members also have the ability to influence what a grower may plant the following year by providing feedback at the end of the season. Growers benefit by knowing how to align production with market demand. Buying a share supports local economy. Members have a stake in agriculture; they are able to foster its viability, expansion, and sustainability for the benefit of their community. Are there risks involved in being a produce box member? There are certain shared risks involved in joining any CSA. When snow at high elevation wipes out the primary crop of one grower, his or her loss is considered a loss for all produce box members. Accepting this risk is just one way for a CSA to provide support to local growers. A produce share from Sierra Bounty is unique in that risk is minimized when pooling from a diversity of crops and growing areas. Sourcing produce from multiple growers is advantageous since environmental and pest related crop failures are not likely to be ubiquitous. 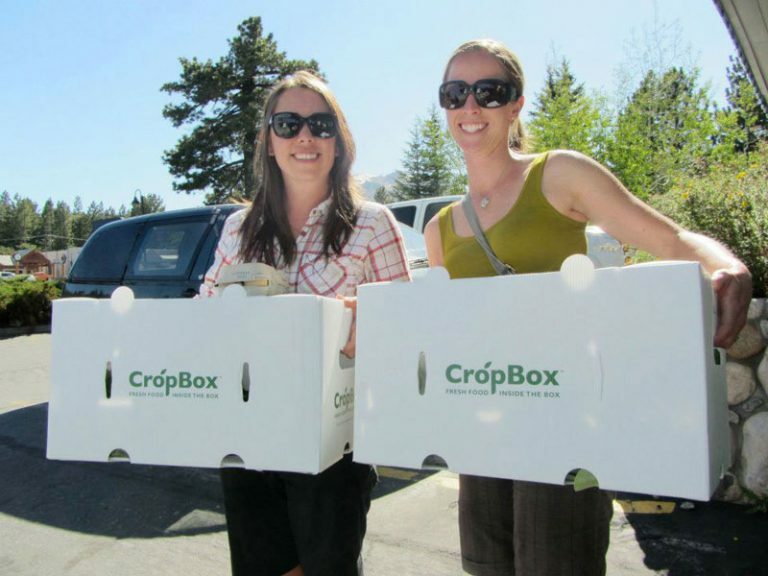 Pooling crops effectively safeguards our produce box members from extensive losses.